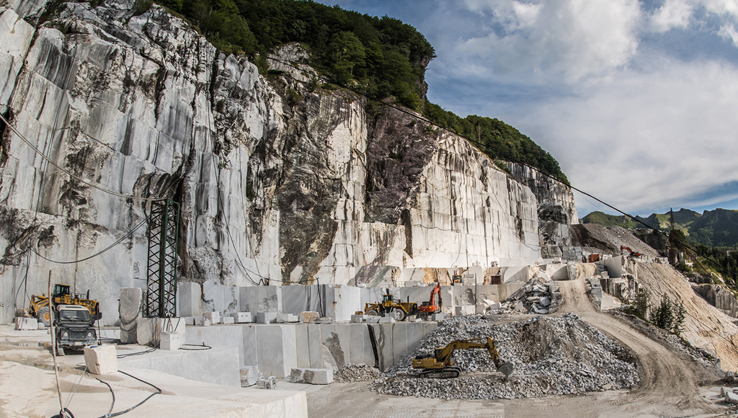 Over 60 years of activity dedicated to the marble, the "eternal material". 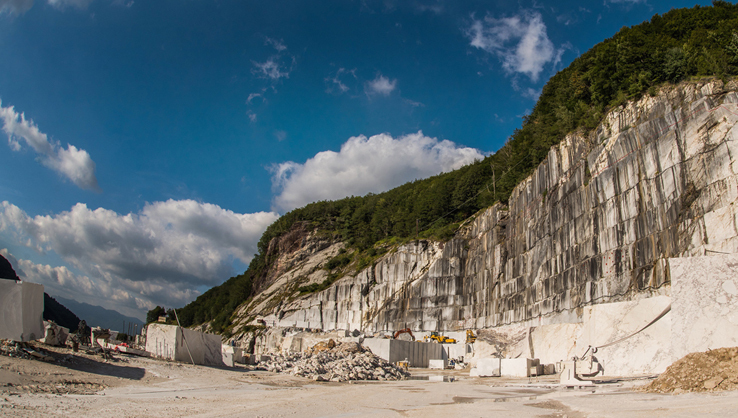 We operate in one of the oldest quarries of Toscana , today a reference point for the entire sector. 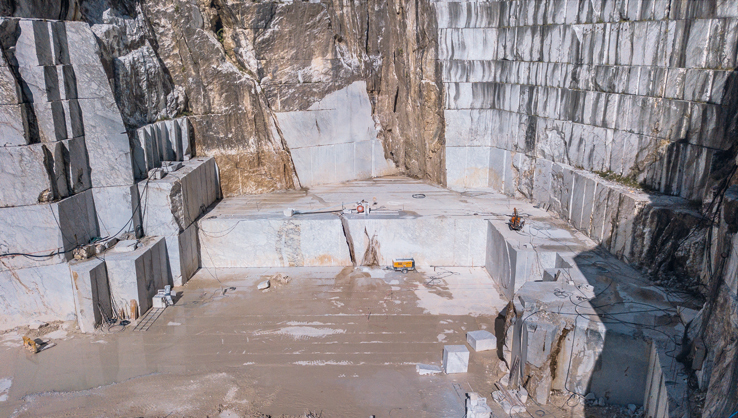 Grigio Perla, Grigio Bardiglio, Arabescato, Calacatta Oro, Breccia Violetta, Venato, have all been included in the New Headquarters, declined according to all possible cuts and in all the assembly methods. The wide range of marbles produced, both ordinary and colored, among which the renowned Calacatta Vagli® and Arabescato Vagli®, has had a worldwide diffusion with very diversified uses. Often the same architects personally select the materials on the mining site to guarantee the most suitable choice for their expressive needs. Cooperativa Apuana started life in 1958 to promote and innovate the ancient tradition of excavation widespread in the Vagli area since time immemorial. The company has dedicated more than 60 years to marble, a ‘timeless material’ which for centuries has profoundly characterised architecture and the history of art, and it is this ‘secular tradition’ that defines the company and the way it operates. Cooperativa Apuana works one of the oldest quarries in Tuscany and is a point of reference for the entire sector. Archway is the place where every design solution is possible! We enjoy challenge and non-standard rooms where we can be as creative as possible. We are happy to complete the most complex projects and to provide you with the interior of your dream! Archway is a company that values innovative ideas! Our designers create high-class and unique architecture objects and interiors to meet any demand. 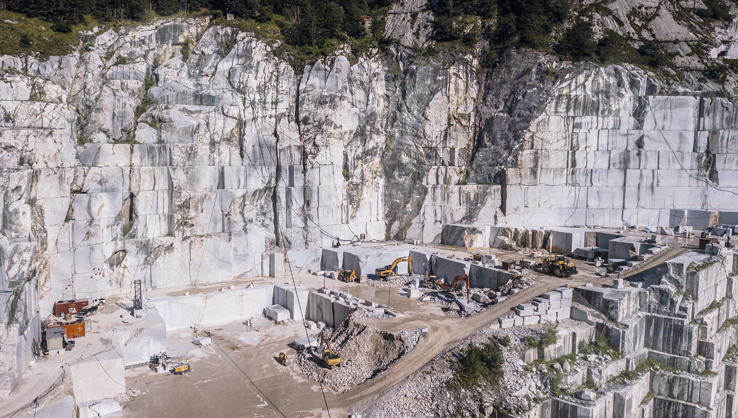 Cooperativa Apuana produces and promotes eight types of Apuan Marble extracted from four large deposits owned by them, including Calacatta Vagli® in all its variations, prized marble used by architectural studios all over the world to create prestigious works. Breccia Rossa (Breccia Vagli Violetta), Grigio Vagli, Venato Vagli, Calacatta Vagli (Calacatta Vagli Rosato). Arabescato Vagli, Calacatta Vagli (Calacatta Oro Extra Vagli), Calacatta Vagli (Calacatta Vagli Cremo), Calacatta Vagli (Calacatta Vagli Rosato), Grigio Perla, Venato Vagli. Arabescato Vagli, Calacatta Delicato, Calacatta Vagli (Calacatta Oro Extra Vagli), Grigio Perla, Venato Vagli. Arabescato Vagli, Calacatta Vagli (Calacatta Oro Extra Vagli), Grigio Perla, Venato Vagli. From the industrial to the civil and residential sectors, the Apuana Cooperative marbles have been repeatedly chosen by world-renowned architects, for the realization of works of great historical and architectural importance. If you wish to receive the latest updates and news, or ask us any questions you are interested in, do not hesitate to contact us.